The uproar in Yemen is continuing to intensify. After days of protesting against the Yemen President, Ali Abdullah Saleh, the people of Yemen finally got an offer for compromise from President Saleh. President Ali Abdullah Saleh presented the protesters with an offer on Sunday. He told them that if he and his sons were exempt from being charged with any crimes, he would officially resign and step down from his role as President of Yemen in thirty days. However, the people of Yemen want an immediate resignation. They do not want to stop protesting for the next month and risk having President Saleh go back on his word and not step down. Essentially, his offer is being viewed as a ploy to have the protesters settle down so he can regain stability in his nation. Seven political parties in Yemen, which combined are known as the JMP, said that the only way they would agree with the resignation offer is if at the end of the thirty days a single new unified government comes together to run the state. The young protesters are adamant that President Saleh is not going to go through with his promise to step down. 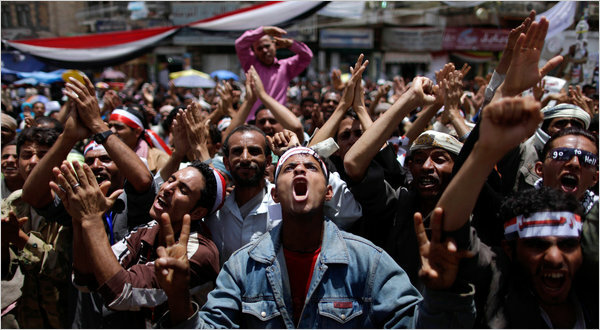 The people of Yemen do not want Saleh, who has already led the state for thirty-three years, to continue his reign. They want him out as soon as possible. They want a political reform and revolution just like the ones they saw in Tunisia and Egypt earlier this year. The youth protesters are making it clear that until there is an overhaul, they will continue to voice their opinions. One issue dividing the opposition to President Saleh is that some want to make sure he gets no immunity for the murders he has committed while others are willing to give him the immunity if it means he is going to leave office sooner. The Middle East has been going through a slow, but positive overhaul in 2011. Even though the events have included murders, homes destroyed, and governments essentially starting over, the big picture is that in many countries, and possibly more to come, the people are finally making their voices heard and are forcing political systems that are actually going to benefit them and not selfish rulers.